Robert Griffin III runs out onto the field. There's no one behind him. Then Lamar Jackson runs out onto the field. An NFL Films cameraman is behind him. Lamar Jackson is the quarterback under center for the start of the Ravens' passing drills. There are five Ravens running backs on the field now: Alex Collins, Buck Allen, Ty Montgomery, Gus Edwards and ... Ray Rice, as @jeffzrebiec pointed out. 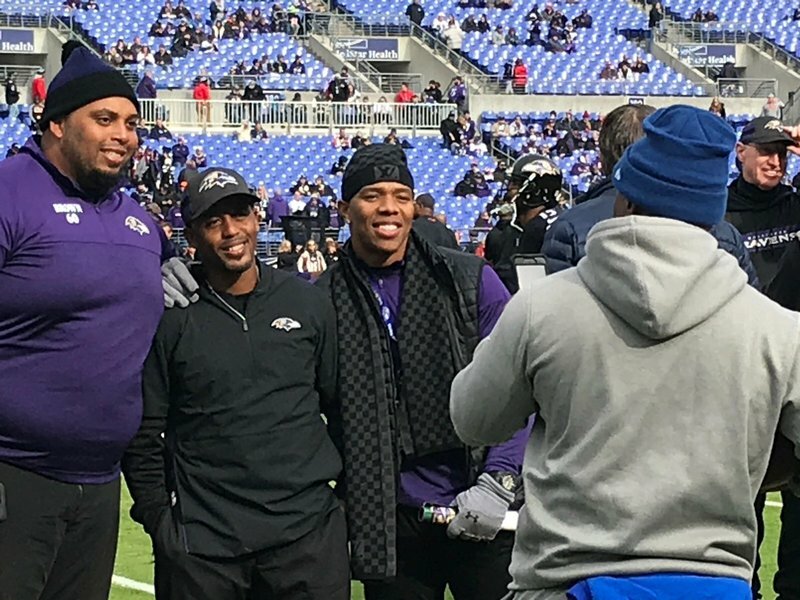 Ravens' 2008 team is being honored through the team's "Legends of the Game." As others have noted, Jermaine Eluemunor is working at LT with the first team during warm-ups. If Ronnie Stanley doesn't play, that would add another degree of difficulty to Lamar Jackson's debut. Despite Saturday's loss, @Towson_FB (7-4) earns an at-large berth to the @NCAA_FCS playoffs and will meet Duquesne (8-3) on Saturday at 2 p.m. Winner will face No. 5 seed South Dakota State (8-2) in the second round. 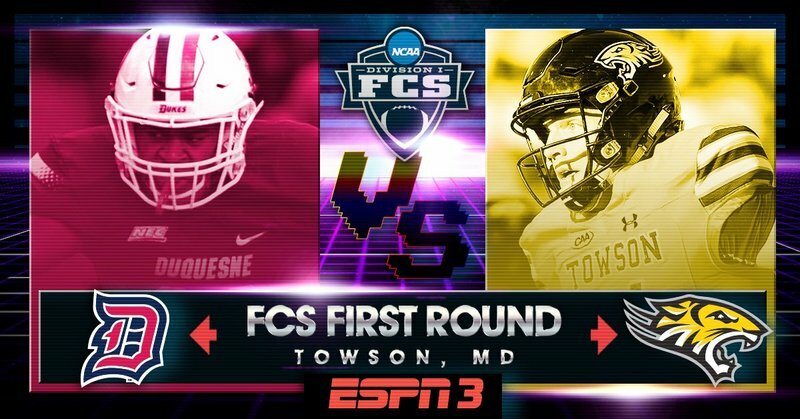 The game between Duquesne and @Towson_FB will be at Johnny Unitas Stadium in Towson. At least one Flacco's definitely in the playoffs this season. Ravens QB Joe Flacco is on the sideline. He does not have crutches with him. Bengals return Justin Tucker's opening kickoff to the 24-yard line, and the wait for Lamar Jackson begins (continues?). Ravens force a three-and-out. Barely. Lamar Jackson and Co. will take over at the 25 -yard line. When Tyler Boyd moved to the slot on second down, Brandon Carr moved with him. The Bengals really picked on Tavon Young in Week 2 so will be interesting to see if the Ravens shadow Boyd with their outside corners all day. If Ravens can't run the ball on this t;eam they are in serious trouble. Ronnie Stanley is at left tackle after all. Ravens getting weird on offense. First two plays were RPOs/read-options, and third lined Orlando Brown Jr. up wide right at WR. Ravens haven't attempted a pass, but why bother when you're averaging 8 yards a carry? So far, the Lamar Jackson-led Ravens offense is every bit as run-oriented as you might think. But it's working. Can the Bengals adjust? Lamar Jackson is fast as a backup and fast as a starter. Ravens are near the red zone. Flags fly as Ravens WR Michael Crabtree and Bengals CB William Jackson are beefing. CB Dre Kirkpatrick gets a 15-yard penalty for a late shove. Every time Jackson runs the Bengals should pound him. Of course, they have to catch first. Ravens RB Alex Collins is in for a 7-yard touchdown. The Ravens ran 11 plays, all of them runs. You watching this, @NavyFB ? This is the run defense we expected for the Bengals. The Ravens already have as many rushing yards (66) as they did in their Week 2 loss to Cincinnati and more than in their Week 9 loss to Pittsburgh. One Bengals writer suggested Lamar Jackson might run for 200 yards against Cincinnati's Swiss-cheese defense. He's on pace. Ravens are getting pressure on Bengals QB Andy Dalton. In a surprise, their pass defense looks a lot better. They'll take over at the 27 for Lamar Jackson's second drive. The Bengals are certainly trying the same formula teams have used against the Ravens D over the last month. Lots of quick throws inside 10 yards. But with Green and Eifert out, they're short on personnel. Lamar Jackson's first NFL pass as a starter is a completion to Nick Boyle. It took only 14 plays to get there. Lamar Jackson escapes a sure-thing sack, then nearly throws an interception on third down. Despite his mobility, he's really struggled throwing on the run this season. Jackson not only a throw back to old days running option offense but he also took a seven to nine step drop back. Shades of Johnny U.
LT Ronnie Stanley hobbles off the field. Jermaine Eluemunor takes his spot. Now Ronnie Stanley is hobbling off and Eluemunor is in at LT.
Ravens have gone from four first downs on their opening drive to one on their second drive to none on their third drive. The #Ravens D has controlled Cincy so far, but the field-position battle is tilting in Bengals' favor. Bengals were averaging 2.3 yards per play until Andy Dalton found Tyler Boyd for a 29-yard gain to the Ravens' 25. Bengals strike back with a goal-line touchdown by Joe Mixon, and it's 7-7. Silver lining: At this point in Week 2, the Ravens were down 21-0. We don't know where the Ravens' run-pass ratios will end up, but via @pfref , there have been just 10 games this millennium in which a team has attempted 20 or fewer passes and rushed 35 or more times. Ravens are at three passes and 17 carries. Ravens need to give tight ends a calculator. They jump off sides every week.